Aadhar Card – What are the benefits? 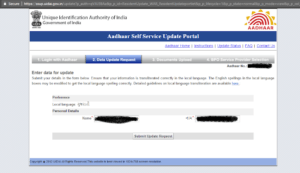 Aadhar Card – Is it mandatory? Aadhaar Card will be accepted as valid Proof of Identity as well as valid Proof of Address document for various government and private sector services such as applying for the passport, gas connection, new mobile phone connection, etc. Since the data are stored in a centralized database, one can easily download and print his/her aadhar Card online from anywhere at anytime without any charges. The printed aadhar Card has the same validity as the original one that applicant receives in the post. 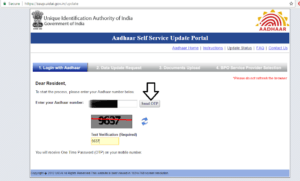 aadhar Card – How much does it cost? Aadhar Card is issued free of cost by UIDAI on behalf of the Government of India. 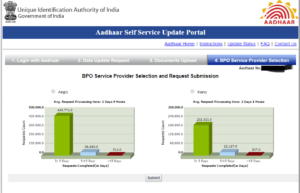 There are no charges for ADHAR Card Form or aadhar Card Application Process. If any representative or individual asks for money, report it immediately to UIDAI. Aadhar Card is not a mandatory document as was recently ruled by the Supreme Court of India. Aadhar Card is a voluntary ID document that every legal resident of India can avail irrespective of their present documentation. The Supreme Court of India issued an interim order on 23 September 2013 saying that “no person should suffer for not getting aadhaar”. The government cannot deny a service to a resident if he/she does not hold ADHAR Card, as it is voluntary and not mandatory. 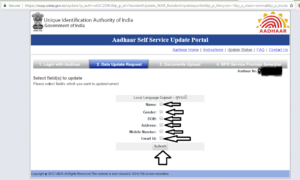 Through online mode you can change in Name, Address, Phone, Gender, Date of Birth etc.You can also make all these changes via post also.To make the changes via post firstly you have to download the Update/Correction Form.You can change following data on your Aadhar Card by sending the change request application through post:- Name, Address, Mobile Phone Number, Gender, Date Of Birth. 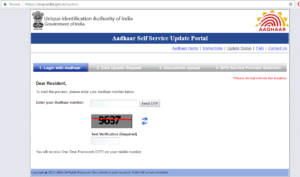 STEP 2: Enter 12 Digits Aadhar card number and click on Send OTP button. STEP 4: Now Select Respective Box That you want to update. 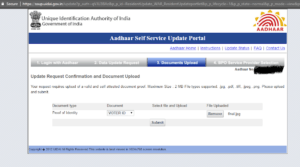 STEP 7: upload a valid document Requirement of the document is depends upon the change request.To make the changes a self-attested document will need to be sent along with update/correction form. 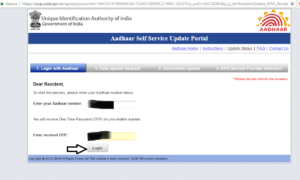 1.To the change of Address in Aadhar Card, a Proof of Address document is required. 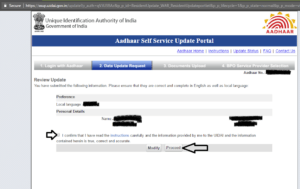 2.To the change of Name in Aadhar card, a proof of Identity document is required. 3.To the change of Date Of Birth in Aadhar Card, a proof of Date of a Birth document is required.